A New Leaf: Busy Bag of the Month: Ice Cream + Numbers = FUN! If you're new to making busy bags or are nervous about making one, this one would be perfect as the first bag for your collection! It's super easy to make and doesn't take too much time. Print this ice cream cone template; you may want to adjust the size. When the size is correct, print 2 copies. Cut out the cone from one copy and the ice cream scoop from the other. The cone you cut will need to be slightly taller than the cone pictured. Trace 10 ice cream cone shapes on the tan colored foam sheet. Cut out the ice cream cones. Trace 10 ice cream scoop shapes on the other colored foam sheet(s). Cut out the ice cream scoops. Using a black marker, write a number, 1 - 10, on each cone. Using markers or foam paint markers, draw sprinkles on each scoop. One scoop will have 1 sprinkle, another will have 2, and so on, all the way up to 10. 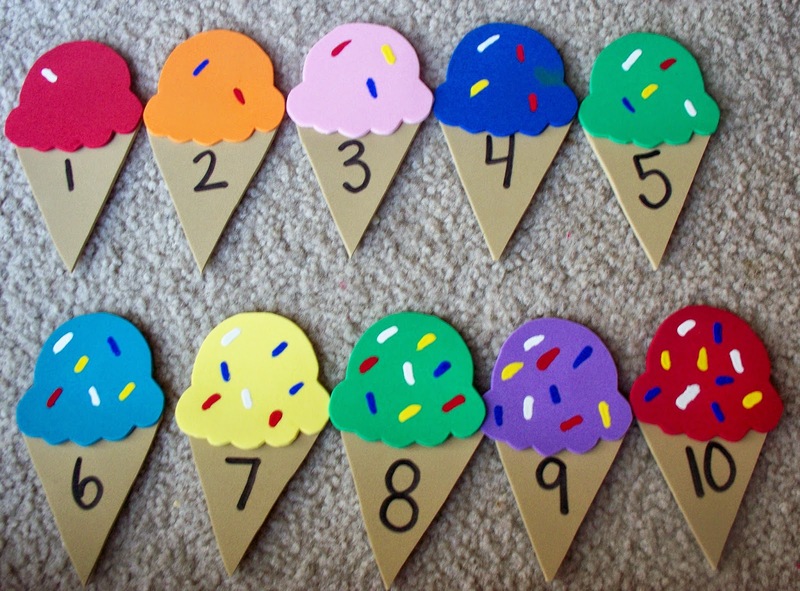 Children can match up the number on the cone to the number of sprinkles on the scoops, and if you use colored ice cream scoops, you can also ask the child to identify the color of the scoop. I also like the idea of asking the child to make up a flavor for each colored ice cream scoop - the blue could be razzle dazzle berry, the red could be strawberry, the green could be booger-flavored! It will give children the opportunity to be super silly and imaginative.